In most cases, the removal of a teeth is move discomforting than the placement of implants. The surgical procedure is done under the influence of a local anesthetic. Intravenous sedation is available upon request. Minor discomfort can be experienced immediately after the anesthetic wears off. This is counteracted with the use of prescription medication. Typically, by the second day only Tylenol is needed. Resorbable sutures are used so within 7-10 days the patient looks and feels as if nothing had been done. When root form implants were first introduced in North America in 1982 the protocol was for submerging the implants under the gum and jawbone for 6 months or longer. A second surgery was then needed to uncover the implant so it could be used to anchor the dental work. Today, most of the time, only one surgery is needed to place the implant in the jaw and it can be used in 6-8 weeks. In some situations the implant can even be loaded the same day as the surgery. Regardless of the needed healing time Dr. Becker will usually provide for some type of temporary appliance so that the patient can function and meet the public with confidence. YES. Most single-rooted teeth can be removed and an implant place at the same appointment. The technology for removing molars (multi-rooted) and placement of an immediate implant is evolving. At this time Dr. Becker usually has the molar removed, it is allowed to heal for 2 months and then placement of the implant. Generally speaking the answer is YES. General health should be good since implant placement involves out patient surgery. Studies have shown that the success rate is greater with non-smokers and non-diabetics although we have successfully placed implants for diabetic smokers. The amount of jaw bone available to place the implants can limit the options but recent surgical techniques and implant design improvements have reduced the importance of bone volume so that we are able to place implants in sites we would not have considered 8-10 years ago. Age is also not a factor. We have place implants in patients as young as 14 and as old as 92. The answer depends on where the implants are placed and how many teeth are supported by the implants and the brand of implant used. Some implant systems are more successful than others. On average, in the upper jaw the success over 15 years is 92-93 %; in the lower jaw, 95-96% over 15 years. What is the best dental implant system? There are lots of good implant systems available. World wide there are about 1300 dental implant companies and in the U.S. about 70 dental implant companies. Not all of these implant companies will make it financially. The last thing a patient wants is an “Edsel” in their mouth. The most advanced implants tend to have roughened surfaces and other technological design advancements that promote healing and ease in restoration. Dr. Becker chooses to limit the use of implant to 3 or 4 implant systems that are assured of being “around” for a long time and employ the latest technological advances. Currently, 97% of the implants restored by Dr. Becker are made by Straumann Co ITI Dental Implant System and Nobel Biocare. The generation of implants now commonly used (called Root Form Implants) were introduced in North America in about 1982. Many of these early dental implants are still in place serving these patients well. So, we don’t know what the upper limit is. The implant systems we have today are superior to those introduced in 1983, thus, we expect long years of use from today’s dental implants. 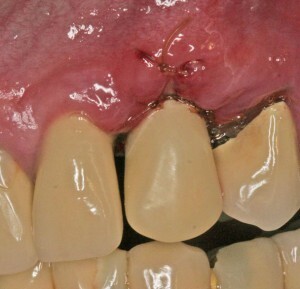 In most cases removal of a tooth is move discomforting than the placement of implants. The surgical procedure is done under the influence of a local anesthetic. Intravenous sedation is available upon request. Minor discomfort can be experienced immediately after the anesthetic wears off. This is counteracted with the use of prescription medication. Typically, by the second day only Tylenol is needed. Resorbable sutures are used so within 7-10 days the patient looks and feels as if nothing had been done. Are dental implants ever rejected by the jaw bone? The process of the bone growing to the titanium implant is called Osseointegration. With the early implant systems about 10% of the implants placed did not osseointegrate. These had to be removed. With the advent of roughened surfaces and improved implant design the occurrence of non-osseointegration has been reduced to less than 0.1%. If an implant does not osseointegrate, it is removed, the site is allowed to heal about 2 months and a new implant can be placed in the same site. Oddly, the statistical success rate for this second implant is greater than the first—no one knows why this phenomenon occurs. How long after dental implants are placed do I have to wait until they can be used for supporting my new teeth? Can a tooth be removed and a dental implant placed at the same surgical appointment? The biggest reason for the popularity of dental implants is their success. There is nothing that a dentist can offer to replace missing teeth that has the potential to last as long as dental implants. As life expectancy increases (86 for women and 78 for men) the need for a reliable permanent dental replacement system for missing teeth has become more evident in the overall health of the patient. Implants provide people with dental replacement that are both functional and esthetic. The demand has always been there, dentists just needed the tools to fulfill that demand. Technology in the biologic world is wonderful but expensive. The quality control assuring each implant meets exacting standards of precision and is totally sterile is costly. The care, knowledge, experience and precision to place and restore each implant case takes years to develop and is also costly. Even so, the cost of placement and restoration of dental implants has come down over the last few years. In some cases, placement of implants can be cheaper than conventional alternatives, such as bridges. Why won’t my dental insurance cover dental implants? Prior to the generation of implants introduced in 1982, the success for implant systems was less than 50% over 5 years for the lower jaw and worse in the upper jaw. Dental insurance companies saw this as a futile and experimental procedure that they were unwilling to support, so they all placed a clause in the insurance contract that disallowed coverage for implants. Since insurance companies are more interested in the “bottom line” than in your health, they have been slow to acknowledge the proven benefits of dental implants. This trend may be easing since we are seeing some coverage allowed for the restoration of the implant but not for the surgical phase. Who should I see to find out if I can have dental implants? Most oral surgeons and periodontists do the surgical placement of dental implants. These specialists usually do not restore the implants with teeth. Nearly all prosthodontists (Dr. Becker is a Prosthodontist) and many general dentists feel comfortable restoring dental implants. If you want to explore the possibility of placing implants then you should contact the people that do lots of them. Dr. Becker restores over 200 implants per year and he works closely with several oral surgeons and periodontists in the metropolitan Denver area. Technology in the biologic world is wonderful but expensive. The quality control assuring each implant meets exacting standards of precision and is totally sterile is costly. The care, knowledge, experience and precision to place and restore each implant case takes years to develop and is also costly. Even so, the cost of placement and restoration of dental implants has come down over the last few years. In some cases, placement of implants can be cheaper than conventional alternatives, such as bridges.Why won’t my dental insurance cover dental implants? Prior to the generation of implants introduced in 1983, the success for implant systems was less than 50% over 5 years for the lower jaw and worse in the upper jaw. Dental insurance companies saw this as a futile and experimental procedure that they were unwilling to support, so they all placed a clause in the insurance contract that disallowed coverage for implants. Since insurance companies are more interested in the “bottom line” than in your health, they have been slow to acknowledge the proven benefits of dental implants. This trend may be easing since we are seeing some coverage allowed for the restoration of the implant but not for the surgical phase.